Sometimes, writers just need to get away. Together. Join us Saturday, Feb 9 for a day of writing, craft conversation, inspiration, and writerly fellowship at beautiful Woodsmoor. Located in Cumberland Furnace, TN, Woodsmoor is only an hour away from Nashville, but a world away from distractions. Whether you are new to writing or an old hand, whether you come with a blank page or an almost-finished manuscript, we hope you’ll give yourself the gift of time, space, and community so as to indulge that part of you that wants capture life in words. At Woodsmoor, there are plenty of unique and inspiring places to perch for quiet, uninterrupted writing time, but there will also be meaningful opportunities to commune with fellow scribes. 9:30 Welcome, Introductions, and Woodsmoor Tour/orientation. Contact Katie@porchtn.org for further questions. We're thrilled to partner with Atmalogy and poet Ciona Rouse in offering a special 6-day writing retreat in beautiful San Miguel de Allende, Mexico. San Miguel de Allende lies in the center of Mexico and is truly a beating heart of the country. A destination for writers for many years, San Miguel draws people passionate about beauty and inspires creation within them. Just one day in the city, and you’ll be elevated creatively by the enchanting doorways, colorful celebrations, charming parks and gardens, numerous art galleries, divine culinary offerings and, especially, the joyful humans who call it home. In this partnership with Atmalogy, we are excited to take you to this surreal destination that makes it “easy to smile,” as Mary Oliver says in her poem “First Day in San Miguel de Allende.” Every writer benefits by getting away from their norm, and we especially love getting away together. Lots of space and time for writing, shopping & exploring! 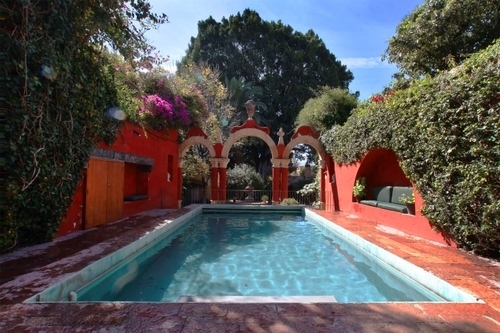 Posada Corazón is an enchanting bed and breakfast in San Miguel de Allende, Guanajuato. It is in a narrow valley, which makes its streets narrow and winding. Most are alleys that cars cannot pass through, and some are long sets of stairs up the mountainsides. Many of the city’s thoroughfares are partially or fully underground. The historic center has numerous small plazas, colonial-era mansions, churches, and civil constructions built using pink or green sandstone.